Introduction: Although translumenal procedures are minimally invasive, there are also various risks involved, such as the intraperitoneal biological and chemical contamination. This study presents a new device made in order to avoid this complication. Methods: Five White Landrace pigs weighing approximately 30 to 35 kg underwent the placement of a device consisting in an expandable sheath whose distal portion is a fully covered self-expanding metal stent, and an introducer made with an outer catheter, a pushing catheter and an inner guiding catheter. The sheath is attached to the stent by suturing it in place. The initial gastric opening was dilated with a 1,8cm balloon. The set is introduced over a Savary wire guide. After this placement the outer tube was slowly retrieved. Finally the delivery system was removed from the pig leaving the entire endoscopic port in place. Results: The EGP was placed easily in all animals. In one animal the first introduction attempt was made with a 0,035”wire guide, but it allowed a curve in the proximal end of the metal stent that makes the procedure very difficult. After the EGP placement, a conventional endoscope was inserted through the device. This insertion was very easily performed. The endoscope made many movements inside the peritoneal cavity and the EGP returned to the gastric lumen in two animals. Discussion: This device provides a conduit for the endoscope to pass through, from the mouth to the peritoneal cavity, and a way to maintain the sterility of the pathway for the endoscope. No difficulties were found in the insertion of the EGP. 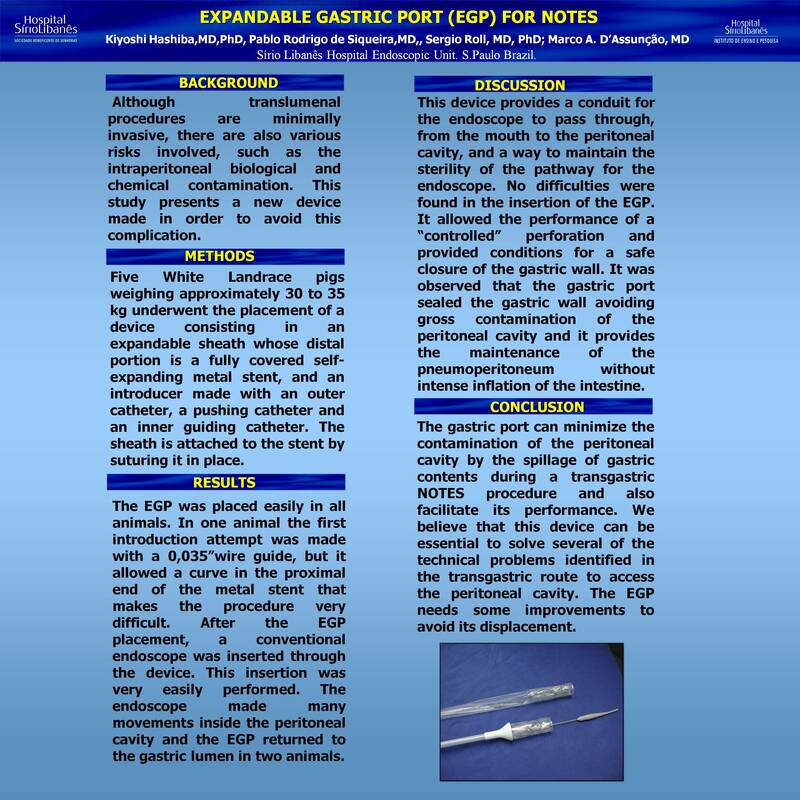 It allowed the performance of a “controlled” perforation and provided conditions for a safe closure of the gastric wall. It was observed that the gastric port sealed the gastric wall avoiding gross contamination of the peritoneal cavity and it provides the maintenance of the pneumoperitoneum without intense inflation of the intestine. Conclusion: The gastric port can minimize the contamination of the peritoneal cavity by the spillage of gastric contents during a transgastric NOTES procedure and also facilitate its performance. We believe that this device can be essential to solve several of the technical problems identified in the transgastric route to access the peritoneal cavity. The EGP needs some improvements to avoid its displacement.